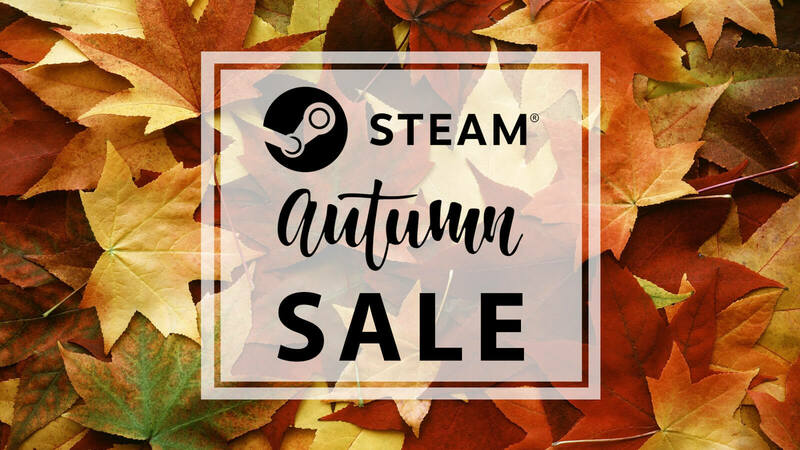 Valve brings back annual Steam Autumn Sale for gamers to find some new favorites as well as Steam Awards. 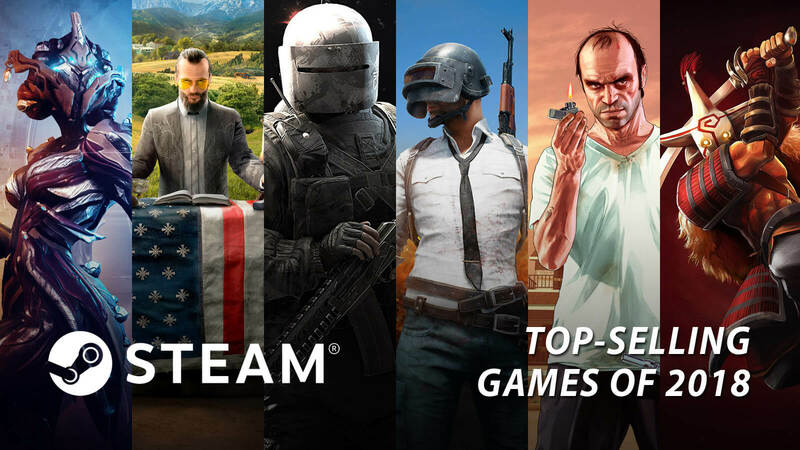 Everyone is going cuckoo with the Black Friday Deals on games and consoles these days but your holiday shopping season now gets more exciting with the Steam Autumn Sale of this year that has over 14,205 titles on sale for PC gamers. Valve's video games digital distribution platform Steam already kick started today and will run till November 27, 10 AM PT. Go browse for your favorite games to see what offer they have in store for you or simply look over the recommendations they have for you. On the highlighted deals from their list we have some good deals for the day and so far titles like Age of Empires II HD at 80%, Cities: Skylines at 75% and Jurassic World Evolution at 60% discount are looking pretty good for now. 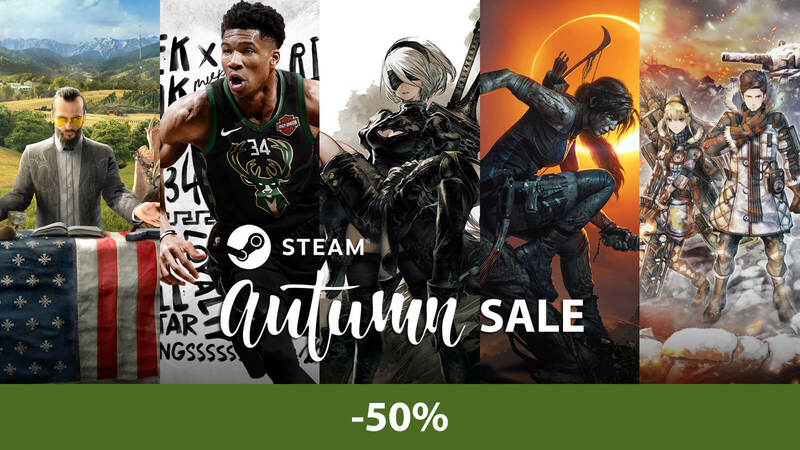 Then there are Dead Cells at 20%, Enter the Gungeon at 50%, Frostpunk at 33%, Grand Theft Auto V at 34%, Graveyard Keeper at 30%, Episode 1 of Life is Strange 2, NBA 2K19 and NieR: Automata for a 50% price off is pretty decent as well. These are what we saw on the screen which is entirely tailored by our frequent searches what it appears. Based on your browsing preference, you may see some more games popping up in the page and some games from your wishlist may also show up there. Action-adventure game Rise of the Tomb Raider from developer Crystal Dynamics and publisher Square Enix is going on sale at 80% off, which makes the title available for only $3.99. 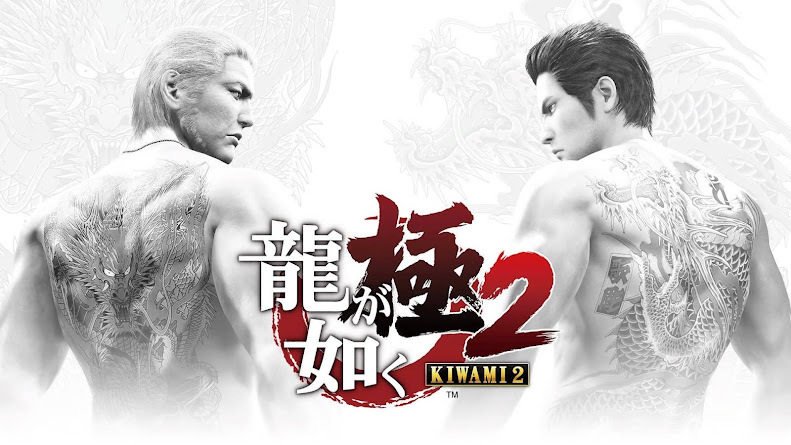 This would be a good pick up choice if you are planning to jump on board with the sequel anytime soon. 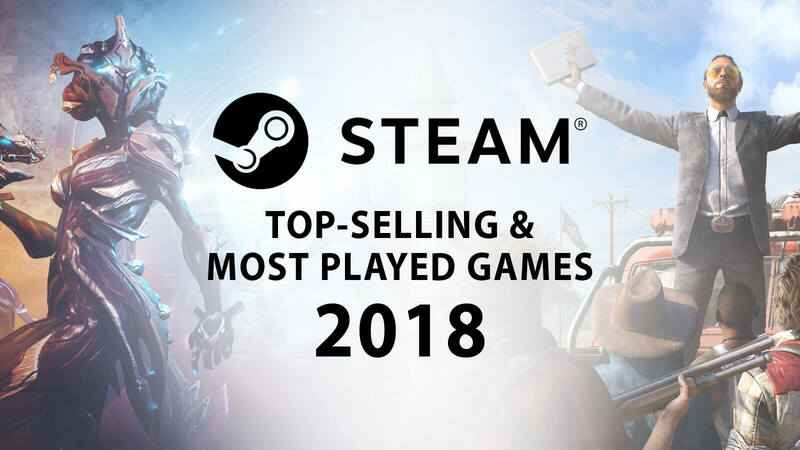 The top-selling chart currently consists of titles like Assassin's Creed Odyssey, Monster Hunter: World and Divinity: Original Sin 2 Definitive Edition, offering a 33%-35% reduction on them. Witcher 3: Wild Hunt GOTY and Civilization VI Gold Edition offers 60% and 69% money off for now. Far Cry 5, Rocket League, Shadow of the Tomb Raider, Total War: WARHAMMER II and Valkyria Chronicles 4 are all available on half of their original price. Artifact, Farming Simulator 19 and Playerunknown's Battlegrounds are the only two games going on their regular price. 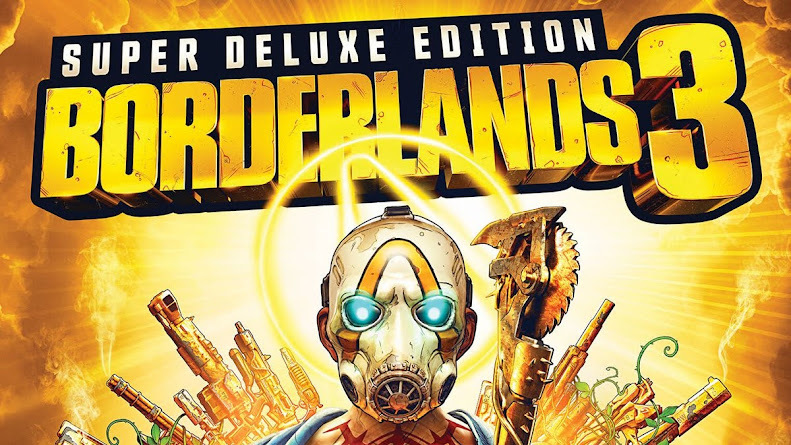 From Bethesda Softworks, post-apocalyptic role-playing franchise of Fallout is on 50-75% off excluding Fallout 76. Both Fallout and Fallout 2 is available to grab on a 75% off while Fallout 3 GOTY and Fallout: New Vegas Ultimate can be yours for a 50% reduction. Fallout 4 base game or VR edition is up for grabs at 50% price but Game of the Year Edition offers a solid 60% off. The Season Pass for the game with a lot of add-on content is going up for 67% less than general and there is never a bad time to go back to the wastelands. 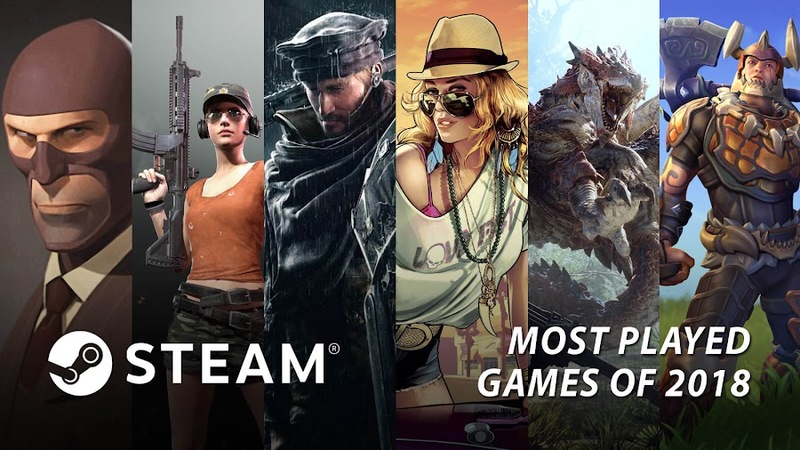 This season is also time for choosing Game of the Year like many other renowned platform and Steam Awards has returned to do the same. They have opened up and taking nominations for your favorite games and will accept your votes even after the sales end. You can just pick up any games to nominate from now on and the finalists will be revealed from those in December. The voting will then commence to determine winners, which will be announced in February 2019. The developer studio that brought you games like Dishonored and The Evil Within, has another critically acclaimed game in their fold and yes, we are talking about Fallout 4 from Bethesda Softworks. Not only this one is the best from the Fallout franchise but it also stands out among many great games that the developers have created. This nuclear war surviving big-boy won the 2016 BAFTA and 2016 D.I.C.E. Game of the Year along with more than 200 awards already. Fallout 4 lets you enter a world ravaged by nuclear warfare as the last survivor of Vault 111 and you step into a world that is a diminished husk of what it ever was. You fight for your survival and make choices to get ahead in the game. 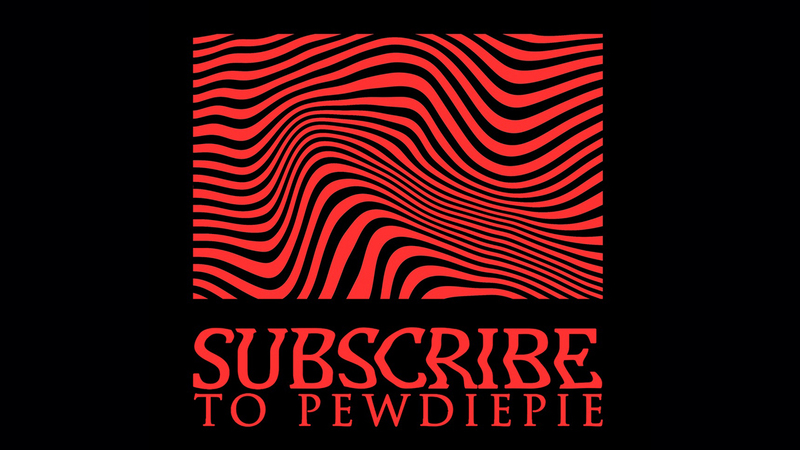 All of your action will help you shape the future of this post-nuclear Wasteland. As you play ahead, you will realize why Fallout 4 is such an award-winning big-shot. The original Fallout 4 game is fully updated for the Game of the Year Edition and includes six add-ons: Automatron, Contraptions Workshop, Far Harbor, Nuka-World, Vault-Tec Workshop and Wasteland Workshop. Fallout 4: GOTY is already out now for PC, PlayStation 4 and Xbox One. So, whether you are going for the digital version or the hard copy, be sure to book it from selected retailers as soon as you can. 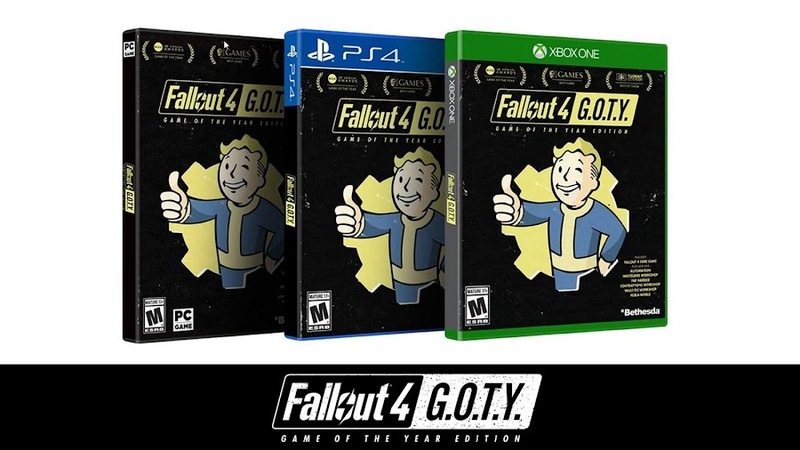 Bethesda also brings in a limited number of Fallout 4 G.O.T.Y. 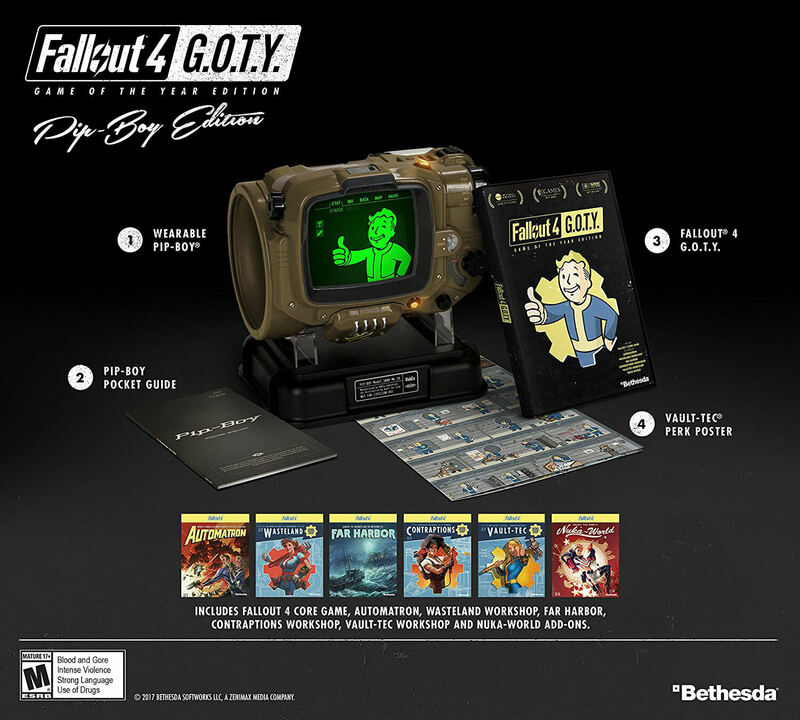 Pip-Boy collector editions in celebration for the Game of the Year Edition. We would like to give you a friendly reminder that these copies will only be available in North America to some selected retailers. 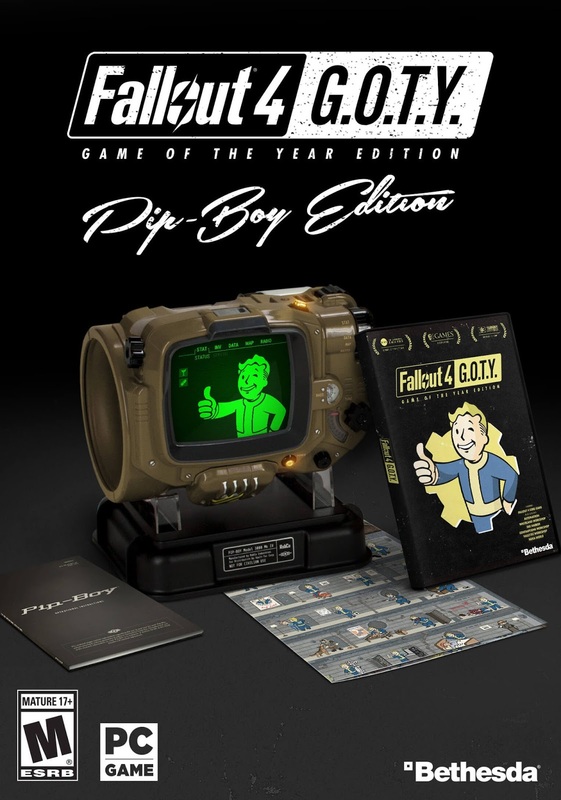 This Pip-Boy Edition is out now too, which will cost you $99.99 and it includes Fallout 4: Game of the Year Edition, Pip-Boy Wrist Mount and all 6 DLC Packs. A few years ago, we couldn't even have those Pip-Boy Editions for Fallout 4 and now, we are having a Game of the Year Edition and all that. If you are still not content with the Fallout 4 G.O.T.Y. and Pip-Boy collector editions, then you have to hold on a little longer for more as December 12 marks the release date for Fallout 4 VR. So, that means, you haven't seen the end of it, yet. Virtual reality is becoming a trend these days and it is also impacting the video game industry. 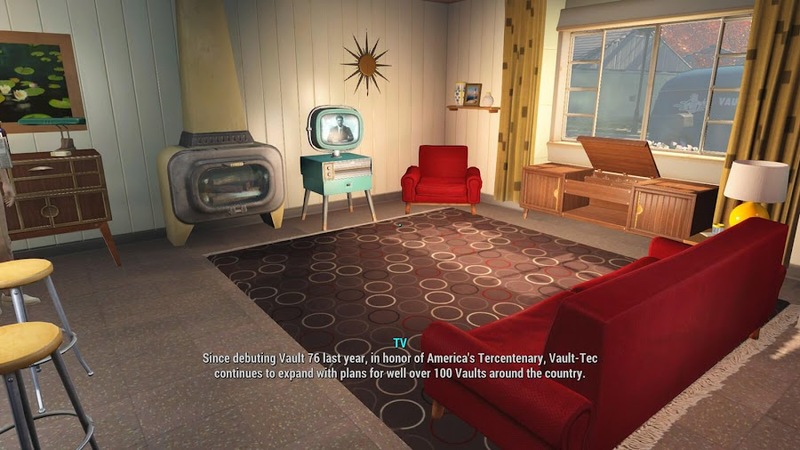 Many studios who realize the potential of riding this tide are releasing VR versions of their popular titles now to give their fans an all-new 3D experience and Bethesda Softworks decides to be wise like that. So, what they did is that they have taken projects of pre-existing games like Doom, Fallout 4 and The Elder Scrolls V: Skyrim to produce VR versions for them. Aside from the superior graphics excellence of modern time, Doom actually hasn't evolved from its core concept of shooting massive hordes of demons from Mars, beside the improved visuals have amplified the intensity of the game even more. We are not saying that's a bad thing but how about getting a bit more up close and personal with the minions of Hell? That wouldn't be so bad and Bethesda already gave us a preview of how it would look like at E3 2017 Showcase. We agree that Doom VFR will blow first person shooter loving gamers mind if not the brains. Fallout 4 is perhaps the most successful title of the entire Fallout series and probably that is why Bethesda has chosen the title for a VR treatment. As you struggle to survive in a post-apocalyptic world, the virtual reality makes the aspects of the game pretty real to you. The entire game is re-imagined and you will notice that in combat and crafting. It's not just a tour of the Wasteland but the complete in-game world of the original game and t hat includes hundreds of locations. Even if you have played Fallout 4 before, this is a chance to experience the game once more with a new perspective. The entire open world of action role-playing game Skyrim along with three of its official DLC; Dawnguard, Dragonborn and Hearthfire are what you are getting in Skyrim VR. The scale and depth of this epic fantasy is re-imagined as you fight to save the world from the menace of the fabled dragon Alduin the World-Eater. Fighting dragons and exploring mountains will be more lifelike now than it was when you played Skyrim previously. Be sure to choose your own way to roam this open world as you play. What we learn about the release dates for these VR projects are that The Elder Scrolls V: Skyrim will see release for PlayStation VR on November 17 and then on HTC Vive at some point in 2018. Doom VFR will come out next on December 1 for PlayStation VR and Vive. Fallout 4 VR will be released on PC for the HTC Vive and the release date is December 12. 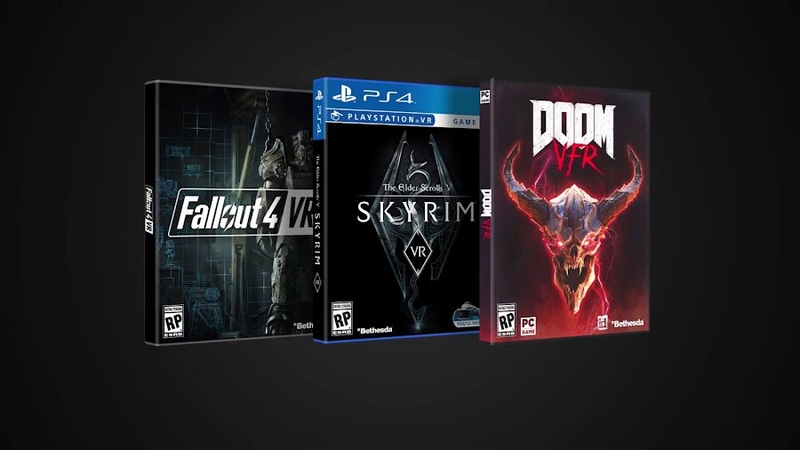 So, we can be pretty thankful to Bethesda Softworks for bringing us all these virtual reality games throughout the year and expect them to create some original VR games as well. It may astonish you to understand that Fallout 4 doesn't have some sort of Game of the Year style version accessible yet, as both Fallout 3 and New Vegas does. For a game that got a lot of fan approval and was so uncontrollably prominent after its November 2015 release, it's the kind of thing that appears to be inescapable and undoubtedly, we'll soon at last witness one. Like its Washington and New Vegas set heralds, Fallout 4 is getting a widely inclusive Game of the Year Edition. 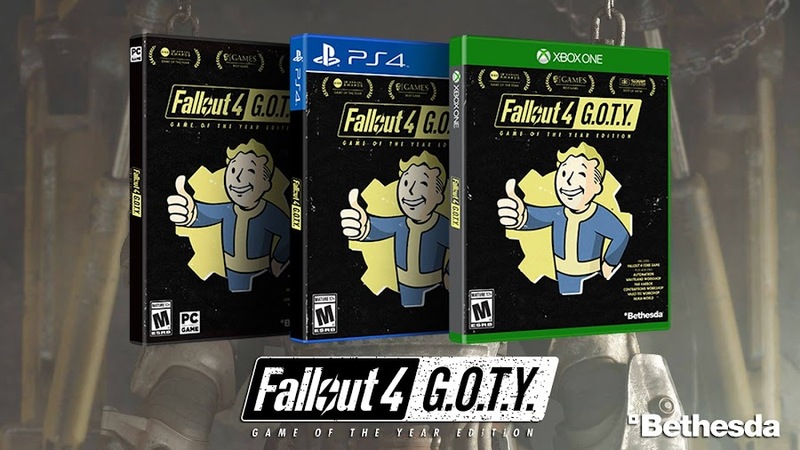 Bethesda Softworks has declared Fallout 4: Game of the Year Edition, a heap of the game with each of the six of its DLC developments: Nuka-World, Vault-Tec Workshop, Contraptions Workshop, Far Harbor, Wasteland Workshop and Automatron. 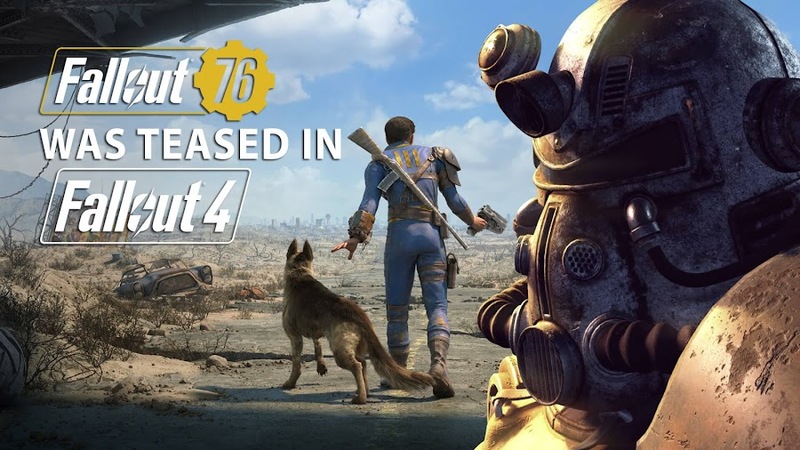 Purchasers will likewise get the chance to exploit the different updates that have been discharged since Fallout 4's came out, for example; mod help and survival mode. The Game of the Year Edition will be accessible for PC, PlayStation 4 and Xbox One platforms on September 26, 2017. Bethesda also reveals that it will be valued at $60. Nearby this form, the individuals who passed up a major opportunity for the elusive Pip-Boy Edition will have another opportunity to get their hands on it. A "predetermined number" will be sold in North America at selected yet unspecified retailers. 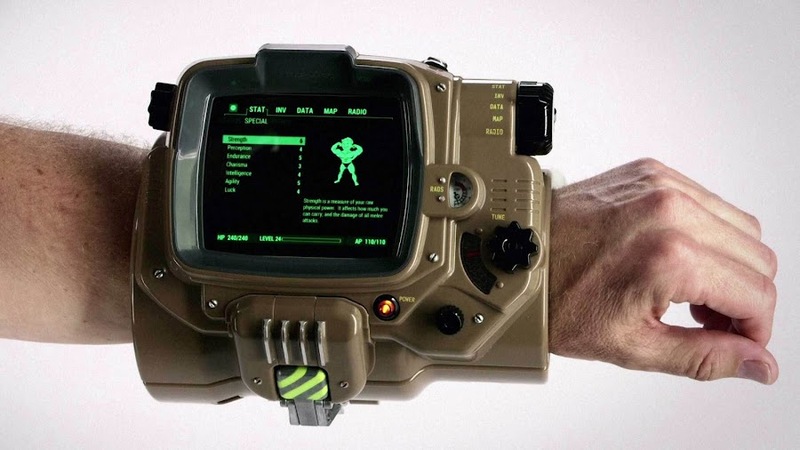 The Pip-Boy Edition broadly incorporates a wearable wrist mount, which you can space your telephone into with the Fallout application to copy the Pip-Boy your character in the Fallout game. This new form of it is estimated at $100, incorporates the Game of the Year Edition.